I am hopping on a plane again today, this time bound for the Orlando Energy Conference. 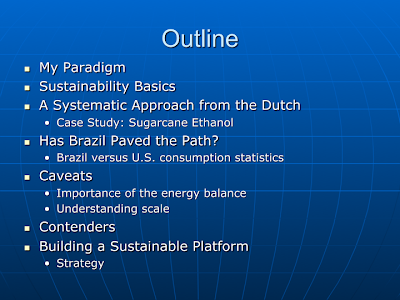 The topic I will present is An Overview of Global Energy Issues. Good thing they asked for something easy and non-controversial. This is the last trip I have scheduled for this year, and I am hoping not to have to travel again for a while. Following Orlando, I will spend a few days at the family farm in Oklahoma, where Internet access has yet to make an appearance. Therefore, I will be slow to return e-mails and respond to comments. If all goes according to plan I will be back in Hawaii on November 21st (after having missed my wife’s birthday for the 4th consecutive year). I quite enjoyed the presentations at the Pacific Rim Summit. I got to talk to a lot of people about what they were doing, and I got to hear the latest from the algae and cellulosic ethanol camps. With the exception of the guys doing algae fermentations, the mood wasn’t great as the challenges of turning cellulose into ethanol and algae into fuel start to manifest themselves. Like I have said before, we have been trying to commercially make ethanol from cellulose for 100 years. There were multiple panels going on simultaneously, though, and I didn’t get to see all of them. Maybe the news in some of the other panels was better. Then there is Joule Biotechnologies. They gave one of the talks at lunch one day. To say people are skeptical is an understatement. I don’t really know what to make of them. I can’t find enough information yet to give them a really thorough critique, but I am not a big fan of issuing press releases following lab tests. Note that they haven’t yet advanced to pilot scale (that comment came out during the talk – that they were moving toward piloting), and they are already making pretty bold claims about yield, cost, and solving the energy crisis. Personally, I think I would wait to see how these things scale. As one cellulosic ethanol executive commented this past week, “These things don’t scale like you think they should.” That’s right, they don’t. That’s why most technologies don’t make it out of the lab. Always better to make conservative claims and then deliver beyond expectations than to make wild claims and fall short. 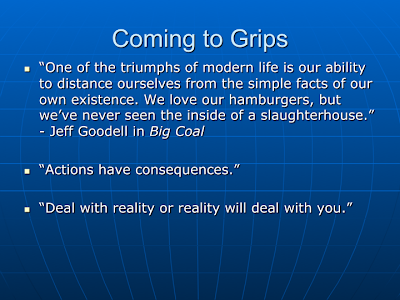 Anyway, here are the slides I presented at the Pacific Rim Summit. There is some overlap with what I presented at the First Nations’ Futures Program at Stanford University on September 27th, but there are a number of new slides there. We have talked a lot about sustainability this week. I must have heard that word a few dozen times the past couple of days. So who in here lives sustainably? We don’t, and our parents didn’t. Some of our grandparents may have, but for the most part they didn’t either. As a society, it has been a very long time since we lived sustainably. So, why is it important then? I once had a friend say “There really is no need to worry too much about sustainability. Mother Nature will ultimately resolve the problem.” The problem with that statement is that I might not like how Mother Nature solves the problem. Hence, it is important to move toward sustainability voluntarily. Our actions have consequences. Who said that? My oldest son can tell you. He hears that all the time, because he doesn’t always connect the fact that when he takes certain actions, sometimes there are bad consequences. The difference between him and the person filling up with gas is he does get to face them immediately. I also don’t know who said that last one – Deal with reality or reality will deal with you – but again it’s like something I tell my kids. The future is coming whether you plan for it or not. If you plan for it, you tilt the odds in your favor. We all view the world through a set of lenses. These are my lenses, and they shape my opinions. I know where we are, but I want to know where we are going to be in 3 , 5, 20 years from now. I believe that we will end up paying a lot more for oil than we do now. I often point out to people that consumers in Europe pay the equivalent of $250/bbl for oil. Thus, I believe the technologies will need to compete against a higher future oil price. We are burning fossil fuels at an unsustainable rate, and we have gotten away with it for a century. We won’t get away with it for another century. As competition for biomass heats up, low-cost biomass is going to vanish. If your business model is based on tipping fees, then I don’t believe that’s a sustainable model. Jim Imbler from Zeachem commented yesterday that Macdonald’s in San Francisco used to pay to have their waste grease hauled off. A lot of people starting making their own biodiesel, and now not only does MacDonald’s charge for the grease, but the mob is stealing it. 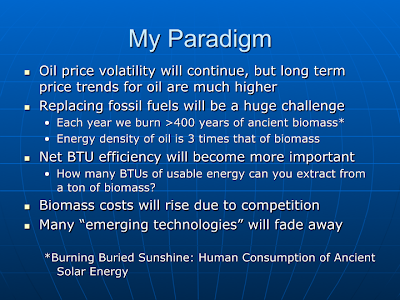 That’s my long-term view of biomass, and that theme has been repeated all week. You better lock in your feedstock. You don’t have the same luxury as an oil company to switch to a supplier halfway around the world. The energy density of biomass makes that proposition problematic. Finally, those “renewable” solutions that are heavily dependent upon fossil fuels won’t compete. More on that later. Anyway, off to the airport now. Probably no new posts from me for a week.